Although mass tourism has reached the Great Wall long ago, most tourism used to be exclusive to a few now very well known sites such as Badaling and Mutianyu. Eversince the boom of home tourism in China this situation has been completely turned upside down and today many of the various sections of the Great Wall in Beijing City Province should be considered well developed. Until recently this was not the case with the Shixiguan Great Wall section. Quite hard to reach for those who do not know the way to access it, and completely unrestored, the Shixiguan section was considered one of the "hidden gems" of the path of the Great Wall in the city province. No mass flock of tourism or steady flow of feet, but instead a long and steady hike of 7.5 km (4.7 mi) along the mountain ridge exploring the border between Beijing and Hebei Province. As time passed more and more local and international hikers have discovered the so called wild wall sections and as result Shixiguan can no longer be considered off the beaten path. In fact, the world renowned travel publisher Lonely Planet has added Shixiguan to its guide book on Beijing as well as to its website, making it now a steady part of the tourist itenerary. Luckily Beijing City Province is really big and not too many opt for a rough day sweating it out on the Great Wall. Shixiguan is still a good place to go and with a ticket office and entrance fee facilities have improved to what many would consider a minimum. Best Options: Rent a Car with driver or work in a pair and drive your own rental car to the small parking lot near the north-eastern end of the Shixiaguan Great Wall. From there explore or send someone to the adjacent end to pick you up. Since the above is also the luxury option the best way to make sure you enjoy a hike without a hitch is to book one of the local tour providers for a guided hiking tour along the wall. That way all is safe and you can concentrate on the experience without sweating t uout worrying whether you'l make it back to your hotel room and comfortable bed. Make use of the Provincial S Trains: For this purpose travel to Beijing North Railway Station (Xizhimen Station reachable through the subway metro system) and from Xizhimen Station buy a ticket to Badaling Station near the Great Wall of Badaling in Badaling Township. From this location hire a taxi to take you miles westward to Shixiaguan Great Wall ( Ruined Badaling Great Wall). It will help if you write this down in Chinese = Ruined Badaling Great Wall (八达岭残长城). Cheap Options: Take Bus to Shixiguan. The way to get there is to travel from Deshengmen Bus Station which is situated at the historic Deshengmen City Gate in the north-west of Xicheng District of the old city center of Beijing. From Deshengmen Gate Bus Station one can catch bus Line 919 which travels to Yanqing Dong Guan Station in the town of Yanqing, administrative center of Yanqing County, the westernmost of the four rural districts of Beijing City Province. At Yanqing Dongguan Station (Yanqing East Station) switch buses and take bus 876 to Shixia Guan Station in the town of Shixiaguan. From the town it is but a short hike up the mountain to the Great Wall. Prepare your route and helpful points for navigation before going just to make sure. Alternative Bus Route: Public Bus: Take Bus 919 from Deshengmen Bus Terminal to Badaling Township, then take a taxi from Badaling Township to Shixiaguan Great Wall ( Ruined Badaling Great Wall). Shixiaguan Great Wall location coordinates: 40° 16′ 60″ North 117° 20′ 60″ East. Location: Badaling Township, Yanqing County, Beijing City Province, China (P.R.C.). A Full Google Earth Supported Map of Shixiaguan Great Wall by AsiaReport.com.com. Adjacent Map gives direct access to Shixiaguan Wall Map by Google. Situated due north-west of city proper, Shixiaguan is the westernmost section of the Great Wall of China within Beijing City Province. In winds along the mountain tops at some distance due west of Juyongguan Fortress and runs past Shixia (cun) village from which it derives its name. In the East Shixiaguan Great Wall of China connects to the western fork of Badaling Great Wall of China inside the so-called Beijing Carative Great Wall Natural Scenic Area. 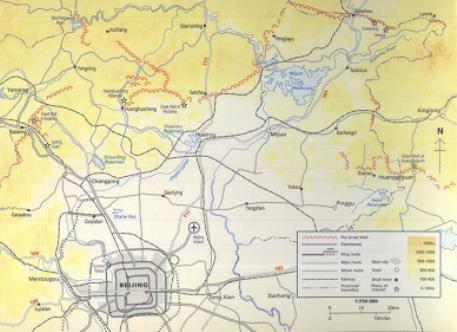 From this point in the north it runs down in an almost north to south direction forming the border between Beijing City Province in the east and Hebei Province on the west side. At the end in the south, the wall turns westward and seperates from the border where it continues as Jiminggou Great Wall of China in Zhangjiakou Prefecture of Hebei Province where it can be followed for many more miles slowly arching northward towards Zhangjiakou Pass City. Altogether the Shixiaguan section is about 6 miles long and counts numerous watchtowers along its pathway. Between Badaling in the East and the border with Hebei Province in the west, the path of the Shixiaguan Wall is well defined and considered fairly well preserved, however the wall and towers are unrestored and heavily damaged in most parts. But a few towers remain standing and in good condition along its length. The Great Wall at Shixia Guan, built is reported to have been constructed around 1600 AD during the Shenzong Reign (1572 AD - 1620 AD) of Wanli Emperor of the Ming Dynasty (1368 AD - 1644 AD). This was almost a century after the disastrous last Mongol Invasion of the region around the Capital Beijing at a time when the Dynasty was already in a irreversable decline and the Manchu had united the tribes on the northern frontier. One of the main local legends attached to the Shixiaguan Great Wall section recalls the time of the Peasant rebellion which swept the Ming Empire and ended with a one day fly peasant Emperor taking the throne in Beijing only to loose it to the overwhelming might of advancing Manchu armies. The legend says that fter the founding of Dashun State in Xi'an in 1644 during the reign of Ming Emperor Chongzhen, Li Zicheng (1606 AD - 1645 AD) was the leader of the peasants from northern Shaanxi Province, who wanted to overthrow the corrupt Emperors, their eunuchs and the Ming Dynasty. Marching westward from Shaanxi, Li sucessfully led his army east to Badaling Pass but then the question arose of how to take this formidable bastion. It is said that, while the rebels were trying to think of a way to occupy Badaling Pass, an old man advised them to pretend to lead the army to Shixiaguan Pass. With the peasant leader Li taking his advice, the commander of the army defending the Badaling Pass was misled into sending his army southward as a reinforcement of the Shixiaguan Pass. Crucially, or at least as legend tells, this strategic trick allowed the easier taking of the Badaling Great Wall defenses, and not much later Li's peasant army broke into the city of Beijing where panic had ensued. Advised, the usual 8:00 AM - 17:00 PM in Summer, 16:30 PM in Winter. There is however currently no ticket office and the Shixiguan Section is a "wild wall" section with access 24/7 (in theory). Shixiaguan Great Wall is located at some 70 kilometers (43.5 miles) or 1.5 hours driving outside of Beijing. There are several options for getting to this remotest corner of the city province. The walking distance along this section is 7.5 kilometers (4.7 mi) which takes between 3 to 4.5 hours to hike. 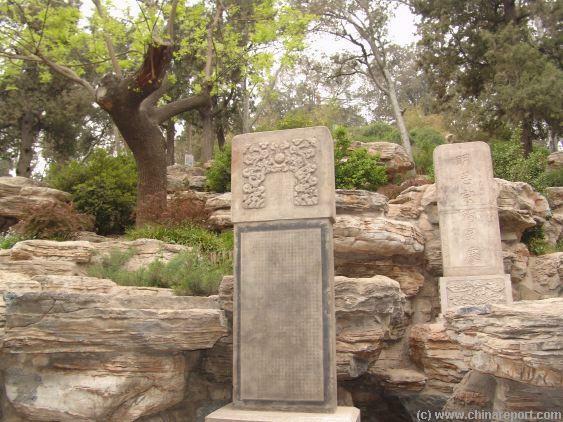 Two Commemorative Steles erected in honor and memory of the Chongzhen Emperor stand at the Foot of Jingshan among Rocks near the "Chongzhen Hanging Tree" a popular tourist stop over just north of the Palace Museum in Beijing. According to local Beijing Hiking Guides a castle in Shixiaguan was pulled down during the now notorious Great Leap Forward period (1958 AD - 1961 AD). Interestingly, due to the rebel offensive in the year 1644 AD, the Shixiaguan, Stone Gorge Pass itself does no longer exist. This relatively minor gate was apparently crushed and destroyed by the rebels. Yanqing County and its reputation as wild wall it is also incorrectly but understandably known as the Ruined Badaling Great Wall (八达岭残长城). In may 2012 the Great Wall of China Forum received postings complaining of anti-Government slogans having been painted on doorways and walls, right up to the highest points of the previously mostly pristine Great Wall section. There is little doubt that these slogans have since been removed. News of the protest and vandalization was supressed and the issue blocked on the internet in China. You Tube Video: A Hike along the Shixiaguan and Badaling Great Wall of China. 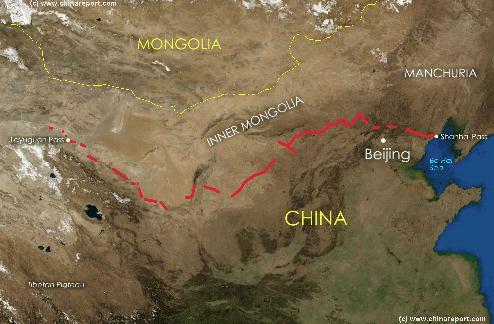 As can clearly be seen on the below available Google Satellite Image Map the Great Wall stretch of Shixiaguan is truly a wild wall. First and foremost, as it is (mostly) unrestored, the wall itself has crumpled in many locations. Stones of steps and watchtowers have broken and fallen. Altogether this means that proper (hardened) shoes are advised for the hike. In addition, following the hilltops and crossing several ravines, the wall of Shixiaguan is well defined and easy to find on a map but not always easy to reach physically. At many points shrub forests and trees block the way along the wall. During most of the estimated 7.5 kilometers hiking on top of the wall is not an option. Last but not least, steep inclines and drops make for spectacular scenery, however they also make for a arduous walk. As a wild wall section a lone private hike along this section of the Great Wall of China is not advised for first time visitors. Although, there is no danger from the people, slipping and making a fall is all too easy. With a broken ankle the hiking should be over however the problem then becomes how to get down on your own. Therefor, perhaps book a guided tour the first time around, or .. just make sure you take it easy so you can make a safe return.